Uncovered the garden today and surveyed the damage. Not too bad. We'd kept it covered since the teen-temp-time because it was dipping down to freezing temps almost every night and we didn't want to be out there during the cold mornings before leaving for work in the dark uncovering just to be back out there in the cold dark when we got home covering it back up. 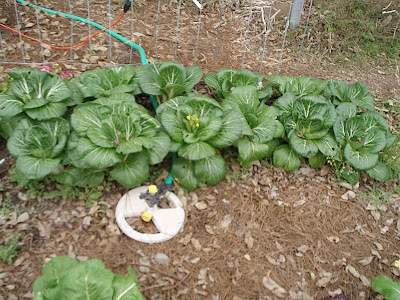 Some of the lettuce got bit pretty bad and a few of the coles were damaged a bit, but not much was so damaged it wouldn't come back ~ just two or three lettuce plants looked so bad I didn't have a lot of hope for them, so I pulled them and gave the chickens a snack. 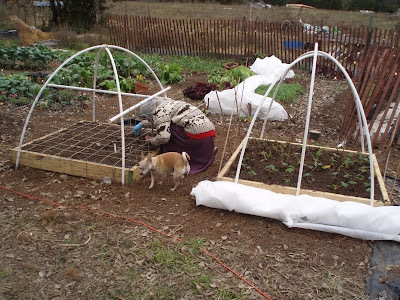 After much planning and map drawing, Helen planted her square foot garden. Looks cold, doesn't she? Some of the bok choy was flowering, so I decided to pull some. I hated putting a hole in this beautiful little bed, but it had to be done. And the final result ~ Shrimp & Bok Choy stir fry with peanuts. It was fabulous! I think tomorrow I'll pull the other ones that were flowering and make more to freeze for lunches next week. Fry the onions, peanuts and garlic in the peanut oil 'til onions are soft. Add the bok choy, oyster sauce and fish sauce, cooking 'til bok choy leaves are wilted and stems are soft. Add the shrimp and cook until they're done, being careful not to overcook them. This can be served over rice or with noodles, but I didn't want the carbs so ate it as is. It was really good! When I eat oriental food, I usually leave the extra cabbage once the meat is gone. But with this, even just bites of cabbage with a couple peanuts were marvelous. Wow! That looks delicious! 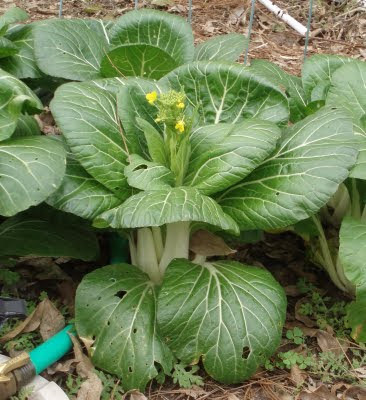 I've never known anyone to grow their own bok choy. Thanks for the inspiration!